The word "mythological" is taking hold of the Hebrew media. Listen to a broadcast or read a newspaper and you will encounter this fad. People who should know better are lavishing the term "mythological" on various actual entities---an outstanding athlete, a sports team, a rock group, a local landmark, a record album that sold well. It's not only newspeople who are representing our realities as myth. The distinguished author David Grossman referred in a British newspaper to David Ben-Gurion as "Israel's mythological first prime minister." A big-name business promoter recently described our military command center as "one of Israel's most mythological institutions." This is misuse. "Legendary" is probably what they meant. Real-life subjects are not "mythological," a term that belongs to dragons, unicorns and the Tooth Fairy. Are we having a problem distinguishing between reality and fantasy? Hold the question. Last week some 300 people including President Shimon Peres and Defense Minister Ehud Barak gathered in Tel Aviv's London Park for a tribute to the late Yossi Harel, who commanded the refugee ship "Exodus 1947." Harel died April 26 at age 90. The ceremony took place at the monument to Aliyah Bet in the little seaside park. Speaker after speaker took the trouble to say thanks to the departed Harel. This was a pointed reminder that the State of Israel never got around to awarding the Israel Prize to Harel in recognition of his contributions to the country. Last week a Hebrew newspaper columnist found irony in Harel's words of acceptance when the Italian government conferred on him its Exodus prize in 2007. This prize, awarded for promoting peace and humanitarianism, is named for a refugee ship that Harel commanded. The Israeli hero thanked his Italian hosts "for teaching your children our history." A headline on an Israeli obituary referred to Harel as "the real Ari Ben Canaan." This was a reference to the fictional refugee ship commander and hero of Leon Uris's 1957 novel "Exodus." Harel was widely said to be the inspiration if not the model for the dashing Ari, portrayed by Paul Newman in Otto Preminger's 1960 movie adaptation. It is not surprising that the word "mythological" appeared in what was written about Harel after his death. In real life, Harel commanded four Haganah vessels that transported 24,000 refugees from Europe in the clandestine maritime operations which Zionists called Aliyah Bet and which Britain called "illegal immigration." One of these vessels was the Exodus 1947, a dilapidated former excursion liner crewed by North American volunteers and captained by Isaac "Ike" Aronowitz, a 23-year-old Israeli who had served in the British merchant marines. Aronowitz, who regarded Harel as a political commissar and disputed some of his command decisions, has also been called the original Ari Ben Canaan. Uris put a disclaimer on the first page of his book: "There may be persons alive who took part in events similar to those described in this book. It is possible, therefore, that some of them may be mistaken for characters in this book. Let me emphasize that all characters in Exodus are the complete creation of the author, and entirely fictional." The story of the real-life Exodus is largely forgotten today. 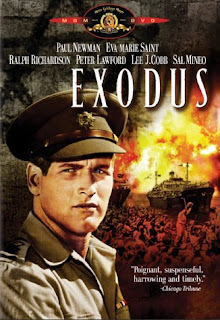 It includes fascinating behind-the-scenes elements which resulted in a public drama after a Royal Navy convoy captured the crowded Exodus at sea July 18, 1947. Built to carry only 400 passengers and a crew of 58, the ship had escaped from a French port on July 11 with more than 4,500 Jewish refugees aboard. In the July 18 battle, three Jews were killed and 28 others hospitalized. Harel, Captain Ike and other underground members evaded capture by a standard Haganah ruse. They went to hiding places aboard ship. After the Exodus docked at Haifa, a work detail of Jews came aboard at Haifa to clean the filthy vessel, and the fugitives walked off among them. With the capture of the Exodus, the British government decided to "teach the Jews a lesson," as Foreign Secretary Ernest Bevin put it. Until then, the British policy had been to intern captured Jews in camps on Cyprus. Under a new policy, the government ordered the Exodus passengers returned to their port of embarkation in France. Except for some 60 infirm and elderly refugees who went ashore in France, the Jews staged a hunger strike off the French coast and refused to debark from the prison ships on which they were confined. After a standoff of more than three weeks, with political criticism and negative news coverage mounting, Britain sent the prison ships to Hamburg, Germany, and put the Jews ashore there by force on Sept. 8, 1947. The bravery of the Exodus passengers and crew may well have hastened the end of British rule here, as a result of the international attention and anti-British feeling which this series of events generated. A much different incident takes place in the fictional "Exodus." In the book, 300 Jewish orphans proclaim a hunger strike at Cyprus aboard an old salvage tug renamed the Exodus, and they win British agreement to sail for the promised land. Nothing like this ever happened. A brief synopsis of the real Exodus story does appear in the novel "Exodus," in Chapter 27 of Book I. It is not an important element in the plot, and it does not convey the political impact of the actual Exodus voyage. The impact of the fictional Exodus has been immeasurable in other ways. This has to do with the story's epic sweep, in which the Aliyah Bet sequences are only a small part. In their times, both the book and the movie offered compelling presentations of the story of Israel's founding. Many things about Harel's life are not publicly known. After his major role in Aliyah Bet, he went on to other activities which included Israeli intelligence and private business. He was only 28 when he commanded the Exodus. As a teenaged Haganah member, he served under Orde Wingate, the legendary British Zionist exponent of Jewish self-defense. Friends and admirers have been remembering Harel as a person of great leadership ability, bravery, personal charm, negotiating skills and modesty. The author Yoram Kaniuk reminisced about Harel's concern for Armenian victims of genocide. The radio personality Natan Zehavi wrote a column in Ma'ariv on May 2 recalling that Harel told him in 1988: "As someone who spent many years transporting refugees, I have special feelings on the subject. It doesn't matter to me if they are Jews, Vietnamese, Palestinians or Indians. It's necessary to help refugees and people who have been exiled from their country." The Tel Aviv gathering in Harel's memory on April 28 ended with a musical conflation of myth wrapping itself around reality. The performer Haim Topol concluded the ceremony by singing an authentic song from Harel's youth. Then, as friends and family filed out of the Tel Aviv park for a busride up the coast to bury Harel at Kibbutz Sdot Yam, recorded music sounded on the speaker system. It was the theme song from the soundtrack of the movie "Exodus." Copyright - Original materials copyright (c) by the authors. Originally posted at http://israel-like-this-as-if.blogspot.com/2008/05/myth-legend-and-fact-in-1947-exodus.html. Please do link to these articles, quote from them and forward them by email to friends with this notice. Other uses require written permission of the author. I interviewed Yossi Harel in my documentary, Exodus 1947. He was a modest person who did not care to brag about what he had done. Truly a decent, brave and thoughtful person. Actually, "mythological" (in addition to being used to define things pertaining to mythology)would also be ok to use in this sense - something on a grand scale, much like "legendary" (which includes the word "legend" in it but I hear no complaints) or "collosal." EX: "For Kobe Bryant to score 82 points in this day and age is a mythological feat." I think maybe you're confusing it with the word "mythical" which IS reserved for the fantastic (e.g., "mythical dragons, faeries, and creatures").